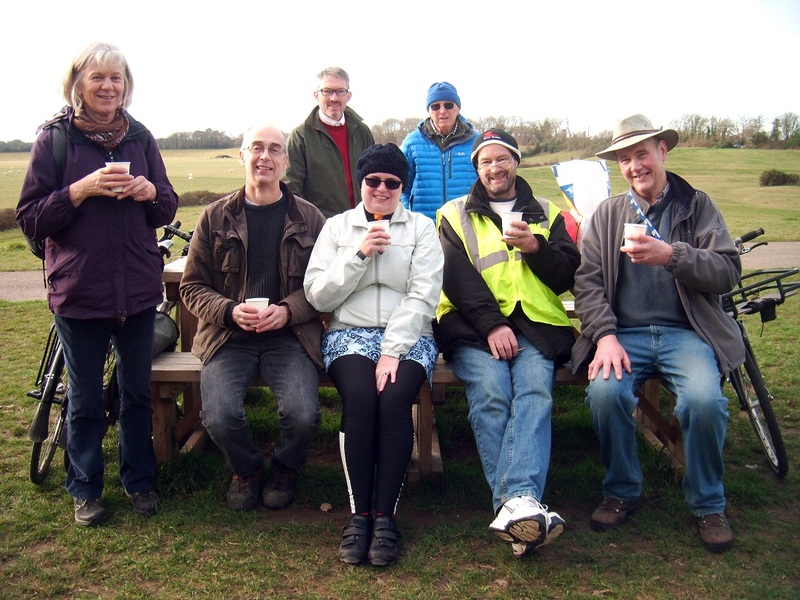 Friends of Centurion Way members gathered on New Year’s Day morning for the annual Beat the Bounds of the Path, aiming to raise awareness that the path is still under threat from development. Beating the Bounds is an ancient parish tradition dating back to Anglo Saxon Times. It is a custom where communities, usually led by church officials, walk their parish boundary so everyone may understand which land lays within their own parish. The Friends of Centurion Way have re-appropriated this ancient tradition to highlight the existing route of Centurion Way, which they wish to preserve. The activity has now become a regular annual event and this year participants enjoyed glorious sunshine in contrast to last year’s rain. On reaching the railwaymen sculptures at the amphitheatre, walkers stopped to cook hot soup and make coffee. The Friends of Centurion Way have been campaigning to preserve the path since autumn 2017. Member Mark Record said: “Linden and Miller Homes are building the White House Farm development on the western side of Chichester. “They pledged to have a southern access road in place by occupation of the 225th home in their first phase of development. “Machines have now broken the ground in both the first and second phase areas of the development but still there has been no public consultation regarding plans for a southern access road which potentially threatens the path. “I regularly attend Friends of Centurion Way meetings and can see our group becoming increasingly frustrated by the developers’ failure to publish their intended plans. Until these plans are released, it is impossible for us to engage in a meaningful consultation process. “One of the primary reasons I purchased my home on the Parklands estate was its proximity to the Centurion Way footpath/cycleway. I thoroughly enjoy my daily commute which begins each day on Centurion Way.